Clean Mill Valley Could Use Your Help! Want to help out but you just don't have the time to pick up litter? No problem! Clean Mill Valley is a volunteer organization supported by donations from local residents, like you! 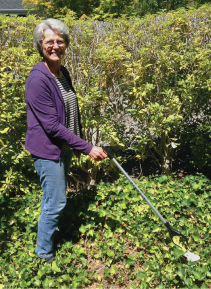 Your donation will help us purchase safety vests, litter pickers and other supplies to keep Mill Valley clean. Donating is simple! Just make checks out to: “Mill Valley Recreation” and (this is really important) on the memo line, write: “Clean Mill Valley” That's it! March Clean Mill Valley Meeting Scheduled! SPRING IS AROUND THE CORNER! Clean Mill Valley will meet at the Mill Valley Community Center at 180 Camino Alto on Thursday, MARCH 14th at 7:00pm. The meeting will be held in the Tamalpais Room. We have a number of activities coming up in which we’ll be participating and we could use your help. There are multiple Earth Day and Earth Month events and the City of Mill Valley will post those on their website and in their email updates. Please contact Joan Murray at joan@cleanmv.org for more info. Mill Valley Refuse Service partners with Clean Mill Valley! 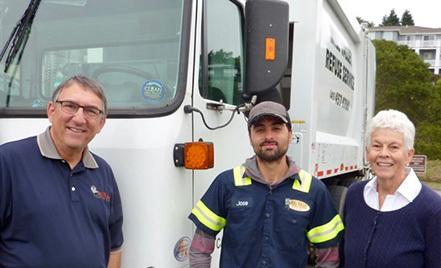 Pictured on the right are Jim Iavarone, co-owner of Mill Valley Refuse Service, Mill Valley resident Jose Cacho, Jr., crew member of the Mill Valley Refuse Service team, and Jill Young, co-director of Clean Mill Valley. Note our decal on the windshield of the Mill Valley Refuse Service Truck. They are on every one of the garbage company trucks as a statement of our partnership with them to Keep Mill Valley Clean. Thanks guys! To receive email alerts about upcoming cleanups or be informed of our plans and activities, simply click here and send us an email with the subject line: Add me to your mailing list. Do it today! So says Joan Murray, shown here demonstrating her pick-up technique. Check out this helpful item for all your pick-up needs! PikStik Pro is a multi-purpose reacher designed for all uses.